The mob, especially the mob in New Jersey, has always had a hand in the trash disposal/landfill business. But a recent examination by the New Jersey State Commission of Investigation (SCI) has uncovered a new twist in the old game. The mob has gone “green” – as in recycling. At the forefront of the latest foray, state investigators say, is a Florida-based businessman with ties to Philadelphia mob boss Joseph “Skinny Joey” Merlino and to members of the Lucchese and Bonanno crime families in New York. Brad Sirkin, 54, who was recently indicted with Merlino in New York and with six other business associates in Tampa, headed Jersey Recycling Services, a company that leased a 104-acre dumping site in nearby Palmyra, and used what was supposed to be a recycling and mulching operation as a cover for a landfill that illegally took in construction debris, potentially hazardous waste materials and dangerous pollutants. Federal authorities in Florida and New York have identified Sirkin as one of the movers and shakers behind a $157 million medical insurance fraud scam that is the focus of two pending indictments. Investigators in New Jersey say that at the same time he was wheeling and dealing in Florida, Sirkin made periodic trips to Palmyra to oversee a dumping operation that could leave the taxpayers of the small, Burlington County community with a multi-million dollar cleanup bill. “In one form or another, profiting from society’s refuse has always been part of the mob’s twisted business model,” Lee Seglem, the acting director of the SCI, said at a hearing in May that focused on organized crime’s incursion into the recycling business and pointed to Sirkin’s Jersey Recycling as one example. 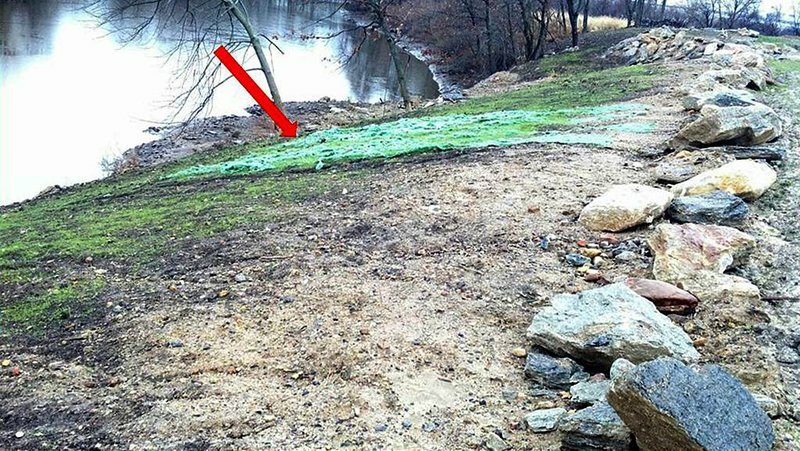 This photo taken by the New Jersey Department of Environmental Resources in November 2013 purportedly shows runoff from the Jersey Recycling Services landfill reaching Pennsauken Creek. Sirkin operated “under the cover of legitimacy,” said Andrew Cliver, the SCI’s lead attorney, in a recent interview in his Trenton office. The laws and regulations covering recycling operations do not require the stringent license procedures and background checks that now apply to landfill operators in New Jersey, he explained. Because of his suspected mob ties and because of a prior racketeering conviction, Sirkin would not have qualified for a landfill owner/operator license. But he was able to obtain permits to run a recycling operation. 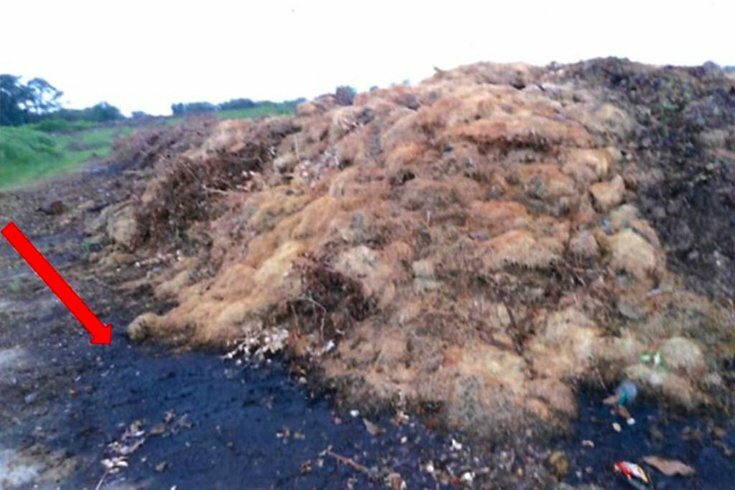 Jersey Recycling was licensed to process 20,000 cubic yards of landscape waste – primarily leaves, branches and grass clippings. The business was to turn that waste into mulch that would then be sold to companies or individual homeowners. Instead, SCI investigators determined that during an 18-month period beginning in 2012 Sirkin’s Jersey Recycling, which operated on a site just off Route 73 and within shouting distance of the Delaware River, took in 380,000 cubic yards of waste material from construction sites and other locations. The material included concrete, brick, contaminated soils, asphalt and rebar. Whether any of those contaminants became part of the mulch that may now be covering suburban gardens or flower beds is one of many questions SCI investigators said they could not answer. Nor could they say whether any contaminants had leeched into the nearby Pennsauken Creek, the Delaware River or the 250-acre Palmyra Cove Nature Park that is adjacent to the dumping site. 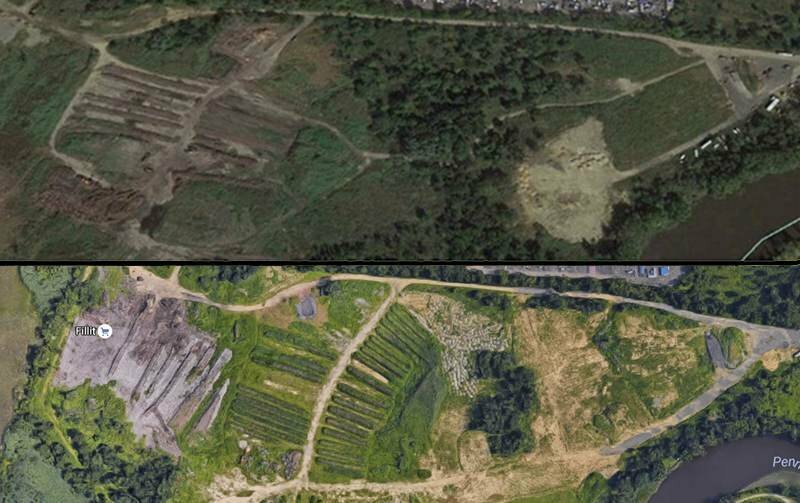 The 104-acre Palmyra property owned by Fillit Inc. is shown, at top, in October 2011, six months before it was taken over by Jersey Recycling Services, and at bottom, earlier this year, after its principal, Brad Sirken, abandoned the landfill in October 2013 and hightailed it back to Florida. The site is a third of a mile from Palmyra Cove Nature Park. Sirkin was subpoenaed to testify before the SCI at a hearing in May, but his lawyer told the agency that if he were to take the stand, he would exercise his Fifth Amendment right against self-incrimination and decline to answer any questions. As a result, he was not called as a witness. Another reputed mob associate, Frank Gillette, did appear at the SCI hearing, but he invoked his Fifth Amendment right in response to every question posed by Cliver, the SCI attorney. Gillette was identified as a “dirt broker,” someone who negotiates disposal deals. Sirkin and Gillette were identified by the SCI as two point men for the mob in the recycling business. Both, according to testimony at the hearing, had ties to an unidentified Bonanno crime family capo from New York who authorities believe had a hidden ownership interest in Jersey Recycling. Among other things, the SCI tracked a $50,000 check from the mob capo to Jersey Recycling that was carried on the company books as a “shareholder loan.” There was no indication that Jersey Recycling had ever repaid that loan, Cliver said. Sirkin’s suspect mob ties – he is related through marriage to a member of the Lucchese crime family, authorities say – also figure in the cases pending against him in New York and Florida. Originally from Staten Island, authorities said Sirkin met Philadelphia mob boss Joey Merlino while both were residents of a halfway house in Florida in 2011. Both were finishing their time for racketeering convictions. After their release from the halfway house, they began to socialize and eventually, authorities claim, they did business together. “He used to drive Joey all over town,” one law enforcement source said of Sirkin, who like Merlino, settled in the Boca Raton area. When Merlino was cited for violating the terms of his supervised release in 2014, one of the convicted felons he was associating with was Sirkin. Among other things, sources said they frequented cigar bars in the Boca Raton area. Sirkin’s son, authorities say, operates a cigar bar there. Sirkin has been described as outgoing and gregarious and, at least at first blush, presents himself as a legitimate businessman. Gural said the 104-acre site is owned by Fillit Inc., a family-run company that leased the property to Sirkin. Sirkin bulldozed and cleaned up the area when he began the recycling operation, but made no attempt to obtain the necessary permits to handle the kind of debris that hundreds of trucks – which sometimes were lined up along Route 73 in the early morning hours – brought to the property. When the SCI began an investigation – sparked in part by information that turned up when agents started to look at Gillette’s operation in North Jersey – Sirkin said he would rectify any problems, Gural said. But when the New Jersey Department of Environmental Protection filed notice that he was in violation, Sirkin ceased operating and hightailed it back to Florida. Gural said he realized something was wrong when SCI investigators showed up at his office and began raising questions about Jersey Recycling and Sirkin. Among other things, they showed Gural a series of mug shots of individuals that he said could have been extras in "The Sopranos," the popular HBO series about the New Jersey mob. The DEP is expected to cite the operation and impose fines for violations that occurred while Jersey Recycling was in business. But that may be the least of Sirkin’s problems. A dirt road off Route 73 in Palmyra leads to the dumping site leased by Jersey Recycling Services. The business, licensed as a recycling and mulching operation, was actually a cover for a landfill that illegally took in construction debris, authorities said. Bradley Sirkin is under indictment in New York with Merlino and 44 other reputed mob members and associates for racketeering conspiracy in a case handed up in federal court in Manhattan. In that case, authorities allege he, Merlino and another businessman, Wayne Kreisberg, were involved in medical insurance fraud. The scheme involved high-priced compound creams to treat joint and muscle pain. That indictment is vague on particulars. But another indictment, handed up in federal court in Tampa at the same time, provides chapter and verse in a scam that authorities say bilked medical insurance companies out of $157 million through fraudulent claims for reimbursements. Sirkin, Kreisberg, a pharmacist and a doctor are among the eight defendants named in that case. Authorities allege doctors were bribed to write phony prescriptions for compound creams for patients who were part of the scam. The borough has sued Fillit, the company that owns the property, demanding that the landfill be cleaned of all contaminants. The civil suit could result in Palmyra taking ownership of the land. Sirkin was identified as the manager of Premier Bio-tech, one of nearly a dozen companies cited in the indictment as participants in the fraud. Kreisberg was identified as the president of WMK Marketing and Bio-Tech Advisory, two other companies tied to the scheme which included control of a pharmaceutical operation that manufactured the creams and billed the insurance companies. Money-laundering is also charged in that case. The Sirkin and Keisberg companies were based in the Boca Raton area. It is unclear if the same companies and the same scams are part of the racketeering charge in New York. Sources have said Florida investigators had targeted Merlino in their probe but that New York “was the 500-pound gorilla” and insisted Merlino be part of its indictment. Under that scenario, Sirkin and Kreisberg had to be added to the New York case in order to charge Merlino with medical fraud. He also faces gambling charges. Sirkin, Keisberg and the other defendants in both pending cases have pleaded not guilty. Those cases are not expected to go to trial until sometime next year. The SCI, meanwhile, is expected to issue a detailed report by the end of this year on the mob’s incursion into the recycling business. At a state Senate hearing in August, the SCI recommended more stringent regulations for recycling operations in the Garden State. But in Palmyra the damage has already been done. The borough has filed a civil suit against Fillit, the company that owns the property, demanding that the landfill be cleaned of all contaminants. Such a cleanup, an SCI investigator testified, could cost “several million dollars.” The civil suit could result in Palmyra taking ownership of the land. 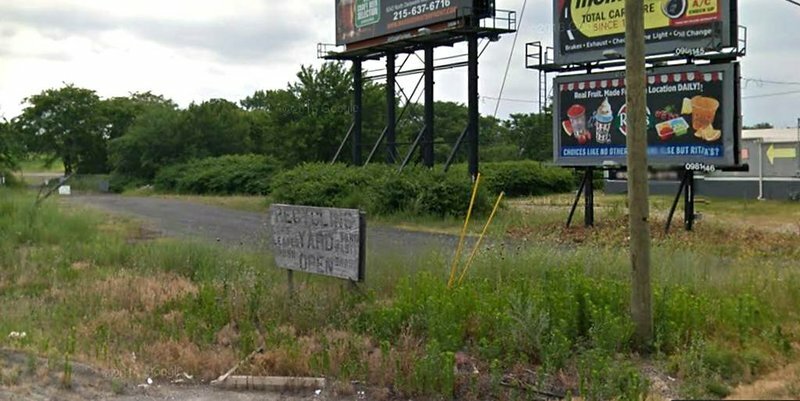 Gural said the borough has long eyed the Fillit property and an adjacent site that was once a drive-in movie and that now is the location for a weekly flea market as a prime redevelopment area. Its proximity to the nature park and the Delaware River would be a developer’s dream. The situation in Palmyra underscores the need for better recycling regulations, say SCI officials. The mob, it would seem, is into mulch. And for now, Palmyra is left holding the bag.